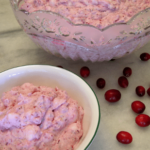 Cranberry Salad is a sweet side dish or dessert for the holiday season. It's made with fresh cranberries, pineapple, nuts, and whipped cream. Rinse cranberries. Crush 1/2 pound at a time in blender with some water. Drain excess liquid from crushed cranberries in a fine mesh sieve or colander. Place crushed cranberries in a container and stir in sugar. Cover and refrigerate overnight. The next day, stir together pineapple (with juice) and marshmallows in a large bowl and let set on the counter for at least 2 hours. Stir every 1/2 hour. The pineapple will melt the marshmallows mostly but not completely. In a separate large bowl, whip the cream using a hand mixer until stiff peaks form. Fold whipped cream into cranberry mixture. Best when served immediately. Refrigerate leftovers. Time stated does not include chilling cranberries with sugar overnight.